The annual challenge of deciding what to give your loved ones for Christmas has begun. With bespoke, special edition gifts, Devon’s Salcombe Gin has made that decision a little easier. From tasting delicate aromatic gin to learning the art of distilling, Salcombe Gin has the perfect present for gin enthusiasts. You can browse their selection of gifts at Exeter Cathedral Christmas Market, from 15 November to 16 December 2018. 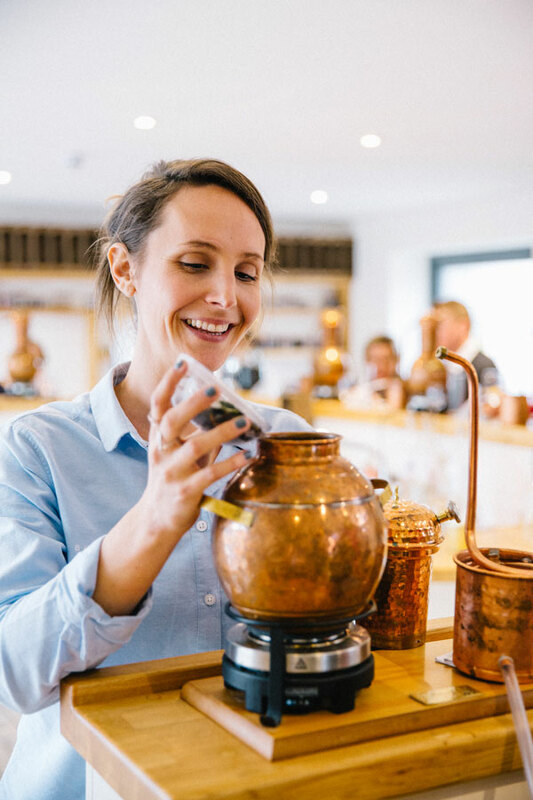 Salcombe Gin’s very own Gin School offers you the opportunity to experience the process of gin distilling. They will teach you every step, from how to distil gin in the copper pot still to serving your personalised gin in an elegant glass. Class begins by learning the art of distilling. You will create a unique gin recipe to be poured into your personalised bottle, encased in an exclusive wooden presentation box. School comes to an end with a tasting of your newly crafted gin at the iconic boathouse distillery bar in Salcombe. A unique Gin School experience is £100 per person or £150 for two to share. Dartington Crystal will provide complimentary engravings of Salcombe Gin bottles and glassware for one day only. To add a personal touch with a name or message, visit Salcombe Gin on Tuesday 20 November at Exeter Cathedral Christmas Market to give the perfect gift this Christmas. ‘Arabella’ is the ultimate gift for someone truly special. The first release from the Voyager Series is limited to 1,200 bottles and was developed in collaboration with Michelin-star chef Michael Caines MBE. A number of signed bottles by this phenomenal local chef will be available to purchase at the market. The recipe has been made with combined expertise and a layering of citrus flavours. Your gin is presented in an exquisite white ceramic bottle with a bespoke copper stopper. Salcombe Gin Voyager Series ‘Arabella’: a collaboration with Michael Caines MBE is £65 per bottle. To purchase the gift of gin this Christmas, visit Salcombe Gin at Exeter Cathedral Christmas Market from 15 November until 16 December. From stocking filler miniatures to luxurious hampers, the team will be delighted to help you choose the right gift for your friends and family.